When you’re starting a startup, your big ideas can get in the way of taking those small, necessary steps in the beginning and you can end up stumbling around, hoping that you fall into the right place. But it turns out those early baby steps are pivotal for finding product-market fit. Stanley Tang of DoorDash set out to discover how to make technology that could help solve problems for small businesses. Turns out, a big problem for small business is establishing a delivery infrastructure. So, Stanley and his would-be cofounders put together a super touch-and-go website with a few menus for people in Palo Alto to order food from a variety of local restaurants. The idea gained traction, and with only an hour of site-building and many conversations with local business owners, DoorDash was started just like that, with the founders as the delivery people and a super simple website. Walker Williams, Teespring founder and CEO, also operated from this school of thought. His company allows people to launch product and apparel brands without risk, cost or compromise. In his early stages, he found that listening to customers was as pivotal as acting quickly on the insights he gained. By abiding by the idea of “doing things that don’t scale,” these founders were able to harness the control and energy of a small startup team that (at the beginning) doesn’t need to have all of the answers. It’s a process of using the resources you have to accomplish what you need right then and using those efficient solutions you build early on as a foundation for success. Sometimes the best way to see if something works, and to see if people will love it, is to just put it out there with the minimal resources you have. Here are some great approaches covered by Tang and Williams to guide you in doing things that don’t scale. You’re probably really attached to your big idea, and that’s great. But, as with most ideas, when it leaves your head and gets some air you’ll find that it may not ignite with everyone in the way that you were hoping. That’s probably because not everyone is like you, which is okay. In order to “roll with the punches,” you’ve got to stay flexible, nimble and open to potential changes you see for your company, so you can continue to learn and grow even if it’s not in ways you were expecting. Williams of Teespring believes strongly in turning your users into champions with a memorable, delightful experience. This is how you’ll continue to test your hypothesis (aka your big idea). Even if someone has left your service with a negative experience, he says that you should always do everything you can to make it right. As many restaurants on Yelp would attest, it only takes one dissatisfied user to taint your entire image online. When you make it clear in your head that nothing is set in stone, then when you’re getting that invaluable feedback from your users — good or bad — you’ll be able to hear it with a more open mind and you’ll be amped to improve the experience for them and future users. DoorDash’s small startup team pieced together tools they already knew how to use to assemble a makeshift system that worked for them in those early stages: Square to receive payments, a Google Doc to track orders and Apple’s Find My Friends to keep track of where their drivers were. In the beginning, that’s all okay. With a small team, small mistakes are just that, but with a big team and a lot of man power, small mistakes have a bigger impact. So it’s good to weed out as many mistakes as possible in the beginning to find solutions that really work best. Even as you continue to build on these short-term solutions and begin turning them into more permanent systems, scaling shouldn’t be your ultimate goal. When you’re the founder/customer support team/operations department, you really get to see how the ins and outs of your business flow … or don’t flow. With a strong base and a complete understanding of your customers, you can gradually make solutions for your company that are more intentional and less experimental. While launching Teespring, Williams found that it was invaluable for the founders to do whatever it took to bring in users themselves. This means putting in a lot of extra time with those early customers. It’s important to note that just because you’re taking small steps doesn’t mean that you’re moving slowly. In fact, quite the opposite. As you continue to learn more and more about your business and get a system in place, it’s important that you move fast because the market is moving fast. If you get stuck and dwell on one thing, the market won’t wait for you. The biggest perk of doing things that don’t scale is that you can continue morphing and adapting until you find the perfect little niche —the little hole that your company has been built to fill. If you look at these short-term goals as breadcrumbs, they’ll lead you right where you need to be. The biggest takeaway of these startups’ early success stories is to start small, hit the ground running, and don’t slow down until you’re truly prepared to scale. Like any startup venture, this process will test your tenacity, your patience and even your dedication. But if you stay light on your feet, listen to your users, and don’t stop until they’re satisfied, you’ll have the foundation of a sustainable business model and the experience to keep growing with confidence. You can read a full transcript of Tang and Williams’s lecture here. Also, if you enjoyed this post, be sure to check out How to Start a Startup: The Book. 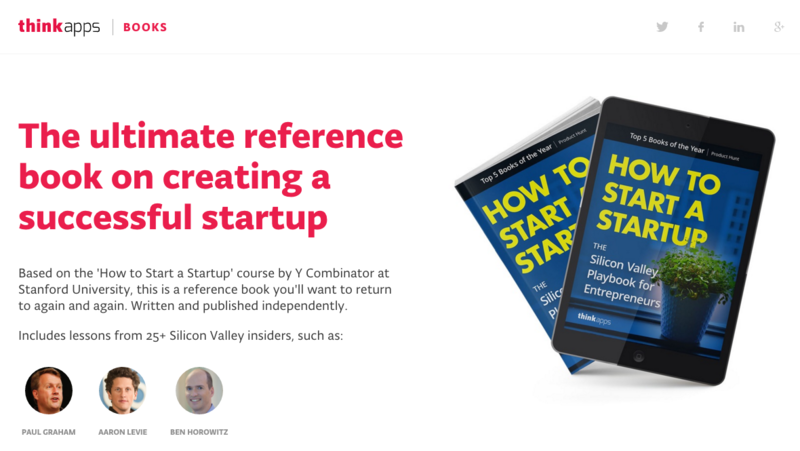 It’s the ultimate reference guide to creating a successful tech startup. Featured image of Walker Williams was taken from the video of this lecture at Stanford University. Katelan is a writer who covers technology, startups, and design. She likes discovering how innovation is constantly impacting our daily lives. Katelan lives in Los Angeles by way of The South.